World Land Trust (WLT) made a visit to East Africa in mid February, with John Burton, CEO and Ruth Canning, Conservation Projects Officer meeting two potential project partners. For many years supporters of the WLT have been urging us to get involved in Africa, but despite several visits we have never managed to identify a suitable project or a suitable partner with whom to work, but that is now set to change. Nature Kenya, and the Tanzanian Wildlife Conservation Society, are both relatively small, but very active locally managed conservation NGOs, who have a strong interest in community land-based conservation projects. 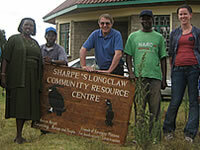 WLT's John Burton and Ruth Canning with Friends of Kinangop Plateau (FoKP), a local site support group for Nature Kenya. Nature Kenya is developing a proposal to acquire small pockets of privately owned grasslands in the highlands near Lake Naivasha. These grasslands are rapidly disappearing and are home to endemic and endangered wildlife, and in particular, the few hundred surviving Sharpe's Longclaws. 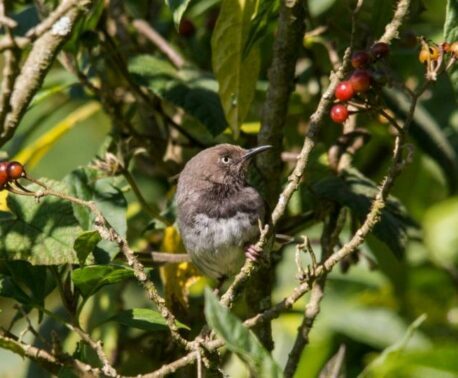 John was lucky enough to see this rare bird during his visit. 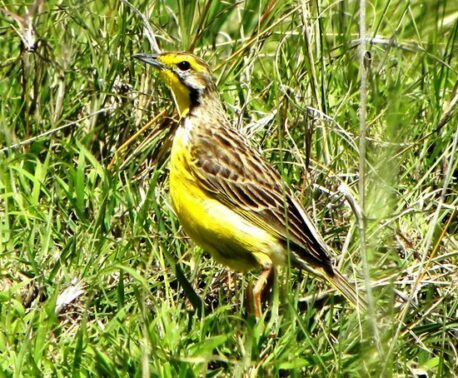 Rather like a skylark with a yellowish breast, it is very difficult to see, and when flushed it flies off as fast as it can and immediately hides. But, just as the skylarks of Great Britain, they are important indicator species and should be protected at all costs. Their grassland habitat is being ploughed up for cash crops – which also displaces traditional cattle grazing. With strong community backing this project has a good chance of success and every 6 acres will protect another breeding pair of Sharpe's Longclaws. The "Bunduki Gap", which will be reforested thanks to funding provided by the WLT. Click on the image to see a larger version. Meanwhile in Tanzania, we propose to use funds already raised for restoration purposes to create a corridor of 263 acres (106.5 ha) between two sectors of the Ulugurus Forest reserves. 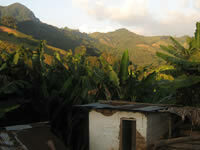 The Uluguru mountains are home to numerous endemics, the best known of which are the African violets: the ancestor of the popular house plant. The surrounding habitats are impacted by human population growth, and, in the long-term, help with community development is going to be essential to prevent encroachment into protected areas. More information on these new project initiatives will be available on the website in due course.